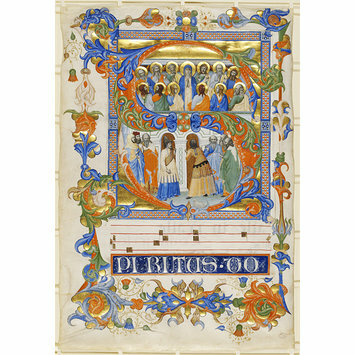 This page from a Gradual (a type of choirbook) was illuminated by Don Silvestro dei Gherarducci for the monastery of San Michele a Murano in Venice. Don Silvestro was a monk of the Camaldolese Order, and worked in the monastery of Santa Maria degli Angeli in Florence in the late 14th century. Santa Maria degli Angeli was home to a number of scribes, painters and illuminators. They worked both for their own house and for other churches and even secular customers. Don Silvestro was active as a painter and illuminator in the abbey from the 1370s. This was not a full-time activity since he was sub-prior and then prior from 1398, both of which were demanding administrative posts. The leaf contains an initial S for the beginning of the Mass for Pentecost. In the upper register, the Virgin prays with the Apostles as the Holy Ghost descends; in the lower, the elders of all nations (carefully differentiated by their costume) wait for enlightenment. Don Silvestro may have worked as part of a team, as some of the ornament appears to have been done by others. 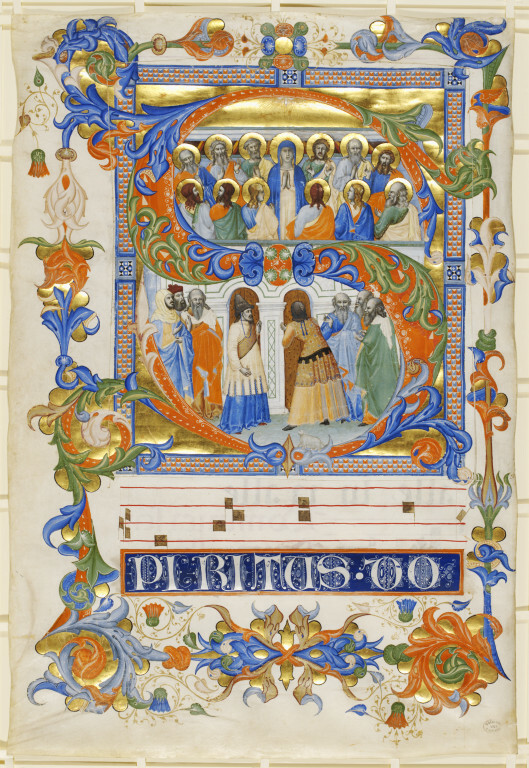 Leaf from a gradual with a half-page historiated initial 'S' depicting the Pentecost (upper register: the descent of the Holy Spirit to the Virgin Mary and the Apostles; lower register: the devout men of every nation); initial and acanthus border in red, blue, green, cream and burnished gold. The initial has been cut out, and then re-attached, secured by strips of scrap vellum pasted to the reverse. The initial 'S' stands for the beginning of the Mass for Pentecost. In the margin there is fleshy acanthus linked by long straight stems. The panel of text [S]PIRITUS DO[MINI] has highlights delicately executed in white, rather like pen-work flourishing. The miniature represents the account of Pentecost in Acts 1:13-26 & 2:1-13 (for the iconography of the Pentecost, see Engelbert Kirschbaum et al, Lexikon der Christlichen Ikonographie, vol. 3, Freiberg im Breisgau 1971, pp. 415-23). In the upper register, the Virgin appears in the 'upper room' with the 12 Apostles, including Matthias who was selected by lot to replace Judas. Above is the Holy Ghost, on whose descent they 'began to speak with other tongues, as the Spirit gave them utterance'. In the lower register, around the ground floor, are crowded 'the devout men, out of every nation under heaven' who were then in Jerusalem. The carefully differentiated exotic costume of the two central figures alludes to the presence of 'Parthians, and Medes, and Elamites, and the dwellers in Mesopotamia, and in Judaea, and Cappadocia, in Pontus, and Asia', while their animated gestures express amazement when each heard the Apostles speak 'in our own tongue, wherein we were born'. In the bottom foreground, a small long-haired white dog witnesses these dramatic events. This spectacular leaf is part of a series of fifty-one identified fragments from two different graduals now distributed through various collections. In addition to this leaf, the V&A holds seventeen fragments from the series, for the most part initials with depictions of prophets (D.217/219-1906, D.221/222-1906, D.224/228-1906, 431, 432 and 3087). Also in the series are a Nativity (3074), Adoration of the Shepherds (D.229-1906), a whole leaf with God the Father presenting the infant Jesus to a group of saints (434), and an initial 'M' with ornamental motifs (2868). To these eighteen cuttings should be added two further initials depicting prophets (D.220-1906 and D.223-1906) also from the group which were lost during the Second World War. Provenance: Florence, Santa Maria degli Angeli, or Venice, San Michele a Murano. Seven fragments, whose date and place of acquisition are unknown, arrived at the South Kensington Museum by an early date; four (2868, 3045, 3074 and 3087) appear in a register recording the internal transfer from the Art Museum to the Library on 6th December 1863 of a group of 241 illuminations, and a further three are recorded in a similar transfer in 1874 (431, 432 and 434). The remaining thirteen cuttings (including the two now lost), were acquired on 22nd June 1906 from Bernard Quaritch for a total cost of £60. 575 x 400 mm; written space 420 x 265 mm. Leaf from Gradual, with half-page historiated initial S. In upper register scene depicting Holy Spirit descending on Virgin Mary and Apostles and in lower register a street scene apparently with people of differing nationalities. Attributed to Silvestro dei Gherarducci. Italy. 1392-1399. A duplicate number MS.965 was assigned to this object in error and was subsequently cancelled.